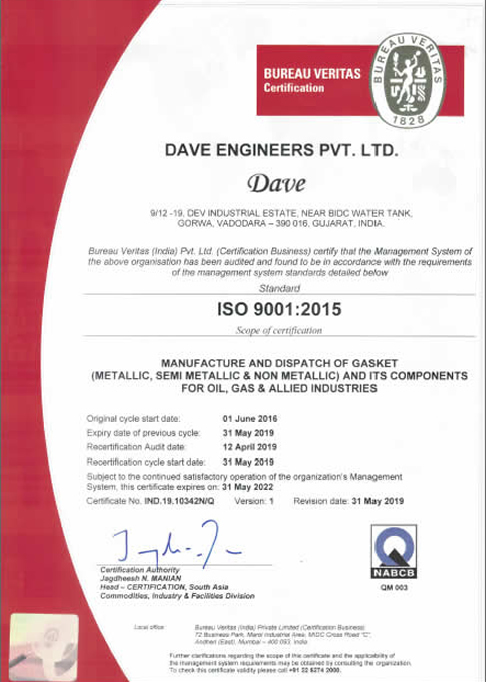 Dave Engineers is an approved gasket manufacturers from Engineers India Ltd. EIL the company is situated at Vadodara (Gujarat) India. The gaskets meeting international standards , is achieved by means of controlled process by latest machines , which insure total repeatability in such critical areas.repeatability in such critical areas. We have research and development department with compression testing machine and laboratory to supported by product specialist & having expertise knowledge about products, application & having extensive field experience to support customers as per requirements and exacting international standards such as AP1 601 ,ASME B 16.2 ,ASME B 16.47 A & B series,DIN, British Standard, JIS Standard and others as specified. To Give Customer Satisfaction Through High Quality Products and the best Services with competitive pricing.